Forum Index > Historical Arms Talk > When Did Brazil Nut Pommels Disappear? Posted: Tue 14 Jun, 2016 11:17 pm Post subject: When Did Brazil Nut Pommels Disappear? When did Brazil nut pommels disappear from swords? We all know that they are a Viking-era pommel that persisted into the High Middle Ages despite being gradually supplanted by disc pommels, wheel pommels, and the other later pommel forms. What is less clear, however, is when we find the very last examples of Brazil nut pommels, before they finally disappear. And this image, from the BNF Le Roman de Tristan (No. 755) is another example of what must certainly be a Brazil nut on a sword. Manuscript Miniatures gives the date as being 1320-1330 AD, but as I have mentioned in another thread, there is reason to believe that it may date to as late as 1400 AD. So when do we find the final examples of this type of pommel? Related to the above, assuming that Brazil nut pommels do not persist after the Middle Ages, what antique sword with a Brazil nut has the most recent date of creation? They never disappeared, I have two newly made ones in my room right now. But seriously, much of the later brazil nut pommeled swords are dated to around 1250. It really isn't a big strech to imagine them being still in action a hundred years later if the sword was kept in good condition and was still fully functional. I was going to say the same thing, including the same bad joke. The (Oakeshott) type A pommel in the first picture is surprising, but could it intentionally represent an old sword type to fit the story? I guess even so the artist would have to be aware of that type. The pommel in the second picture look like a more developed form like E, associated with 13th century, but could be an old sword or done to fit old-fashioned taste. The classic example of a Brazil nut sword outlasting its period is the sword of St. Maurice (Vienna) used for ceremonial purposes. But I guess Craig is really asking, when was the last Brazil-nut sword built for battle? For that one would likely have to look for evidence from other parts of the sword. One example that comes to mind is a type O variant mated to an XVI blade found in central Europe, that is dated to early 14th century. The (Oakeshott) type A pommel in the first picture is surprising, but could it intentionally represent an old sword type to fit the story? The Saschenspiegel is a codification of law from the Holy Roman Empire. Thus, these images are most likely not part of a narrative, but rather illustrations of various laws and customs within the empire. Most of the images in the manuscript seem to depict disc or wheel pommels. However, the shape of the pommel in the above image is so alike to a Type A pommel that I think assuming it was an artistic error/sloppy drawing of a circle can be ruled out. I agree. The cross style looks like type 5 which would put it in 13/14 century...doesn't look like a 12th century sword. Unless someone put an old pommel on a newer sword. The cross style looks like type 5 which would put it in 13/14 century...doesn't look like a 12th century sword. There are at least few swords that combine some kind of Brazil-nut pommel with crosses of type 5 or 6. 13th century seems to more or less the consensus as to dating. You already mentioned the sword of St. Maurice, here are a couple others. From the Christiansen and Kuppelmayr collections respectively. From a Swiss private collection. Sold at Christie's in 1985. The problem with discussing these types of pommels is they aren't easy to define. There are what I consider true Brazil nuts but cocked hat and tea cozy pommels often get grouped together with Brazil nut pommels. I suppose this isn't entirely unfair as there are many who's shaped blurs the lines between them. Anyway, those three pommels (or perhaps three variants of the same type of pommels) are by far the most common until the late 13th century when wheel pommels seem to explode into popularity (wheel pommels had been around for at least as long but were relatively uncommon until this point). Depends on the region and type. Wheel pommel go back to at. Least 11th century and caught on big in Western Europe in 13th century while Brazil variants remained more popular in Central Europe, especially more 'developed' types like E and O. Some BN examples with the curved type 5 crosses go back to 12th century, especially in Baltic regions, but the straight cross with wide fluted ends in the picture looks later to me. Anyway, those three pommels (or perhaps three variants of the same type of pommels) are by far the most common until the late 13th century when wheel pommels seem to explode into popularity (wheel pommels had been around for at least as long but were relatively uncommon until this point). I'm not certain this is true. If there is any reliability in manuscript illustrations as an indication of pommel popularity, it would seem that already during the 12th century, if not earlier, disc pommels and perhaps the odd Type H or I were the predominant form. I am not sure how this compares with extant swords from this time. From the BSB Cgm 20 Armenbibel (Biblia paupera) circa 1360-1375 AD, a late example of a Type N pommel, along with what appears to be a variant of a Type A pommel in the hand of the figure labeled "Tryphon". Honestly, I wonder if this image is a fairly faithful reproduction of an earlier image from the late 13th to early 14th century. The scabbards feel 13th century in style. Likewise, the clothing shown here is an anachronism by 1360 AD. Last, the style of the faces reminds me of 13th and early 14th century illustrations. All of this leads me to doubt whether there were really people still using Type A or Type N swords at this time. Of course, it's certainly possible that a knight, man-at-arms, or even a freeman could own an old sword. However, I am looking for more substantial evidence, whether pictorial or otherwise. Another questionable example, this time from the WLB Cod.bibl.fol.5 Weltchronik dated to 1383 AD. The mounted swordsman to the far left, and the man-at-arms wielding the spear/glaive both the seem to have swords with forms of Brazil nut pommel. It would seems more likely that the artist was just sloppy when trying to represent an H1 pommel. Nevertheless, the sword on the right in particular looks a lot like a Type B Brazil nut with a peen block, although it could be a poor representation of an Type E. Surely, though, this cannot be right that we still see Brazil nuts or their variants on what look like XVa blades. From the same manuscript. Check out the three swords wielded by the men-at-arms to the left. Also notice the exceedingly rare example of a 14th century messer. Could some of these later illustrations be poorly drawn pommels from the Type T (Scent Stopper) family? As J.D. already mentioned, this type XVI mounted with type O pommel is the latest and most evolved sword "version" with brazil nut type pommel we know of outside of ilustrations. In 14th century there are a lot of pommels with rather irregular shapes not easy to draw precisely. Pyramidal, globular, quadrangular, hexagonal... Many of them drawn badly could look like brazil nuts. Type N, E, O are similar to brazil nuts, probably developed from them. It's often hard to say what of these choices was artist's goal. I agree it's unlikely brazil nuts were put on modern blades like XV or XVI. If brazil nut pommels were used it would be on older, type XII or XIII swords. Is the sword on the right an Oakeshott Type XVIa? If so, it looks quite similar to some of the manuscript swords shown in Germany circa 1360-1385 AD. Yes, that's the one I was referring to in my first post. How long do pommels like the one this A&A sword is based upon persist? If this type of pommel persists into the 14th century, it might well explain some of the images of swords with what appear to be Type A Brazil nut pommels. From the description on the website, it sounds like this one is based on the sword from the Hungarian Museum shown below on the right. 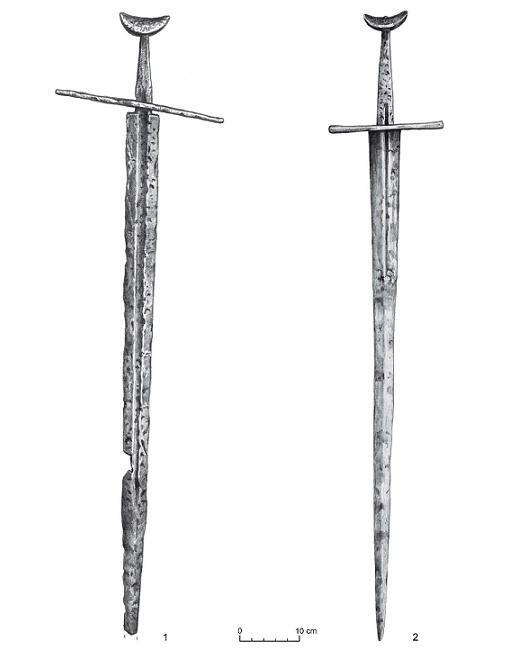 Marko Aleksic classified this sword and four others as type Nb, which he dates almost exclusively to 1200-1250. The sword on the left he classified as type R1a, or type A1 using the earlier terminology of Glosek. Four examples, all from Czech R. or Slovakia. Suggested dating is roughly late 13th to early 14h century. That's supposed to be based on a Hungarian sword with a type N pommel dated to first half of 13th century. However, to me the pommel looks more like another similar sword found in Slovakia with an 'R1a' pommel, which is an elongated type R that you might call a Brazil nut. The R1a is said to persist into 14th century as you say, but seems particular to Eastern Europe. For a detailed discussion and pictures, see Marko Aleksic, 'Medieval Swords from SouthEastern Europe.' Its probably the best source of information on this topic and a must-have for anyone interested in this topic. It shows well how odd Brazil nut forms persisted and developed in Central-Eastern Europe after Western Europe moved more into other styles. The two swords I'm talking about are shown on facing pages (plates 2.1 and 3.3, catalog numbers 4 and 98 respectively).